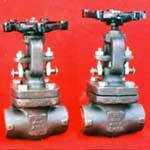 Forged steel valves are widely use in various industries like refineries, petrochemical complexes, fertilize plants, thermal power stations and other process industries. These are designed as per the British standards and accessible in numerous designs and technical specifications. Forged steel valves and forged steel check valves are elite class products manufactured under strict conditions in order to meet the international and national quality standards.